Henry II of France (March 31, 1519 – July 10, 1559) was a King of France and a member of the house of Valois. Henry was crowned King in Rheims, France, on July 25, 1547. 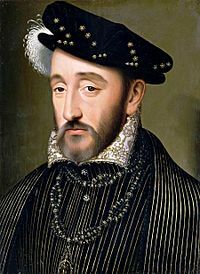 Henry was born in Saint-Germain-en-Laye, France, on March 31, 1519. His parents were Francis I of France and Claude of France. Henry did not love Catherine of Medici. He spent most of his time with his mistress, who was called Diane de Poitiers. Henry died on July 10, 1559 after a jousting accident. He is buried in the Saint Denis Basilica. The next King was Francis II of France. Henry II of France Facts for Kids. Kiddle Encyclopedia.